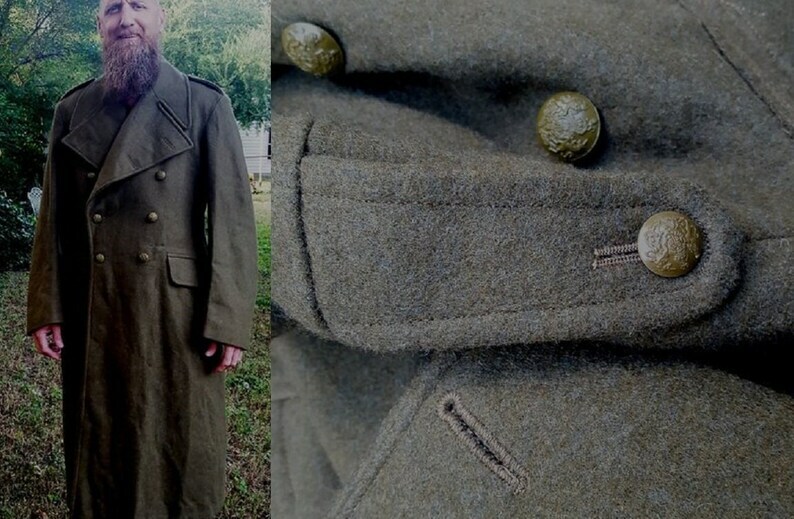 Excited to find this vintage British military coat! 50s coat is army drab green. Check the awesome British crown buttons. Heavy uniform coat makes a fun costume! Great option for Luther (Number 1) on Umbrella Academy. Height 5 ft 11 in. to 6 ft. 0 in. Breast - 41 to 42 in. Despite what the label reads, Reluctant Beard Model says he feels like a paper doll inside this extra large coat. Note about shipping: Please convo me for international shipping. Coat is very heavy. large green buttons with a lion, unicorn and crown. Smaller versions of these buttons appear at the back belt and shoulder epaulets. Th Lion and the Unicorn are symbols of the United Kingdom. They are, properly speaking, heraldic supporters appearing in the full royal coat of arms of the United Kingdom. The lion stands for England and the unicorn for Scotland. The combination therefore dates back to the 1603 accession of James I of England who was already James VI of Scotland.